Besides displaying the standard layers on your map like Water, Gas, Fire Sprinkler, and Electric, you can customize to add whatever layers fit your specific needs. 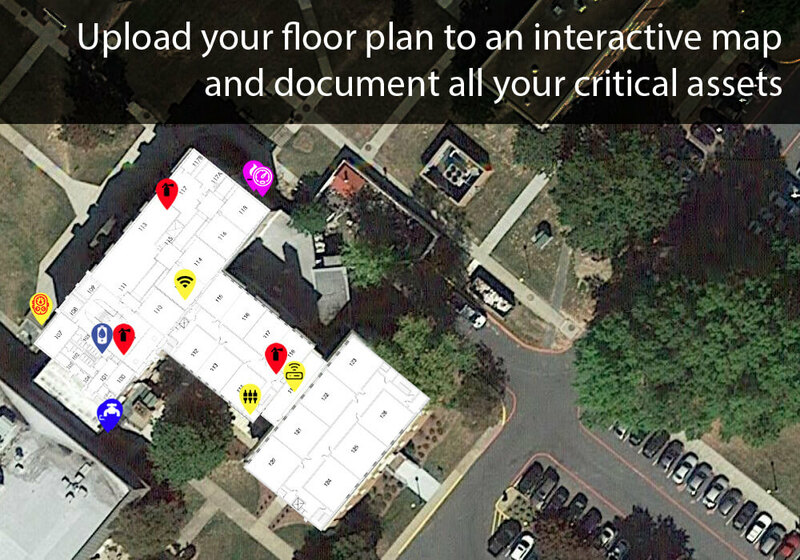 Easily import the floor plans of your buildings and the images and instructions for water systems, fire suppression systems, first aid services, and more. All your information is stored securely in the cloud and can be accessed from anywhere. No more binders of instructions tucked away in the back office. All of the maps and infographics are responsive and will display beautifully on your device whether it's a tablet, smart phone, laptop or desktop. 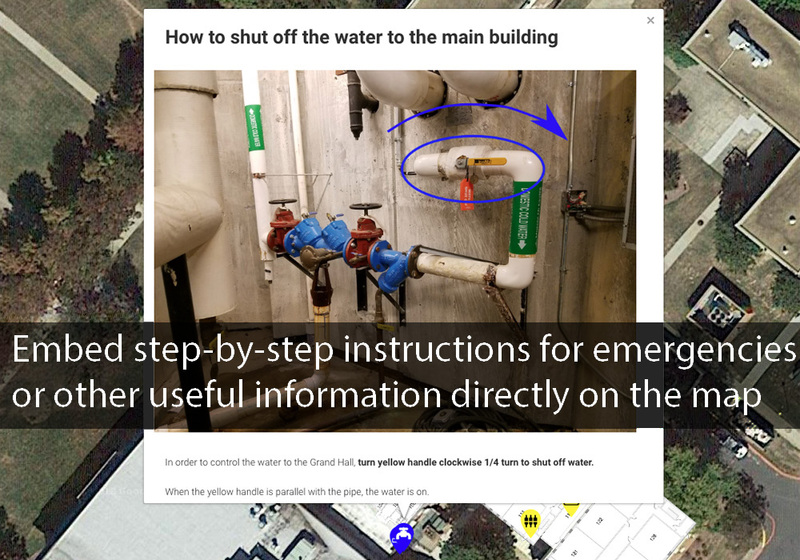 If there is a crisis, whether it's a leaking pipe or a gas line issue, the infographics set up in your MapPlug system can show anyone how to handle the issue with easy-to-follow instructions. Have a visiting technician that only needs to see very limited data? 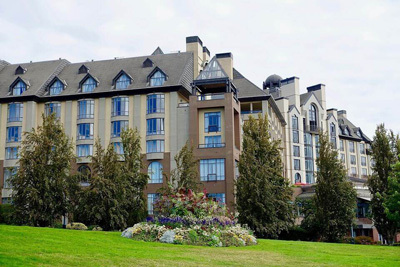 Set specific access for visitors and guests, and keep all your information secure. 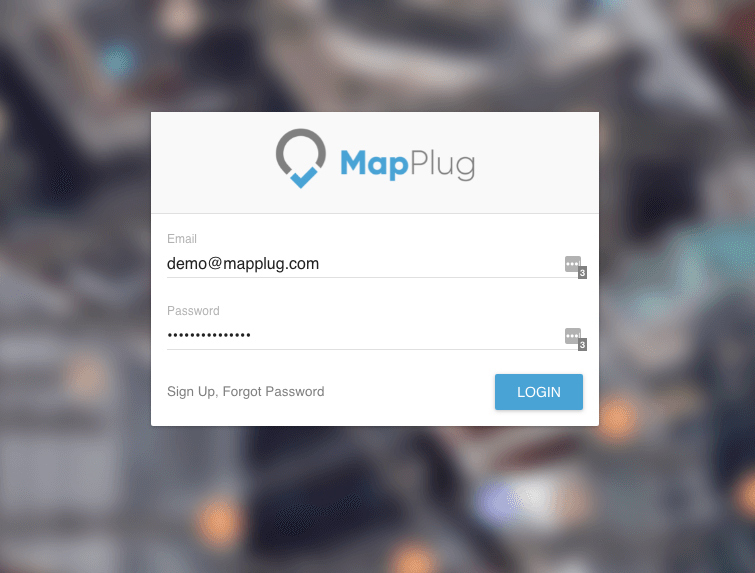 Watch this short video to get a quick idea of what MapPlug really does. Want to play with a live version of MapPlug? 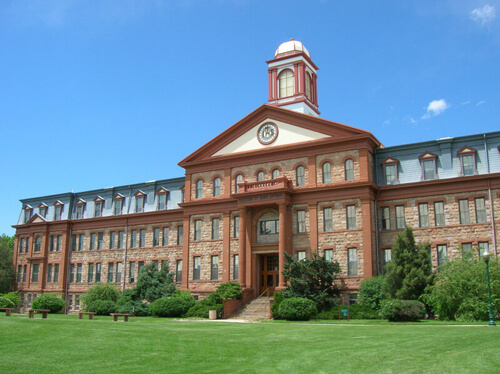 Log in with a public account and look around the school featured in the video above. Just click "Login" to start. You'll be guided by a quick tutorial to teach you the system, then free to look around the school and experience MapPlug for yourself. Need help setting things up? 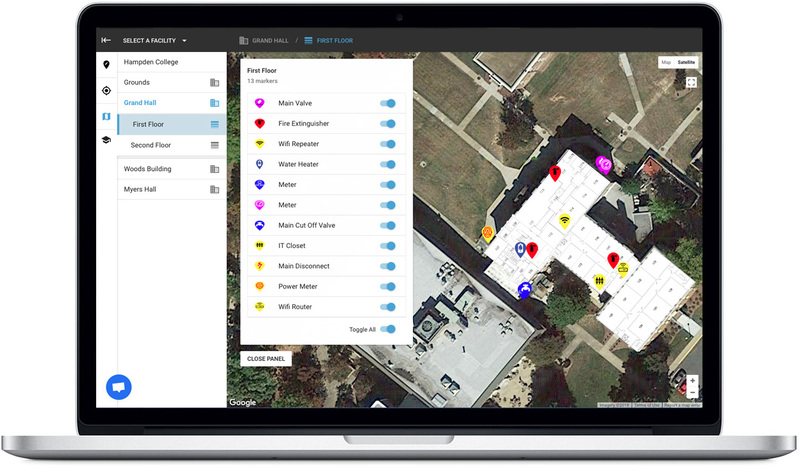 Setting your buildings up in MapPlug goes quickly, but if you're concerned about the time that it will take your staff to get your building details and everything documented, MapPlug can provide either remote or in-person technicians to take all your building info and set it up for you at an affordable rate. Have your facilities ready to go in MapPlug quickly by letting us set it up for you. Do you have floor plans that need to be cleaned up or converted to PNG so that MapPlug can use them? No problem! We are happy to prep your floor plan files for you, and we can even set them up in your account for you. Don't have floor plans at all? Not a problem either! 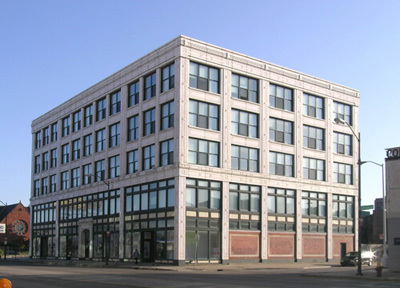 We can connect you with services that can create as-is floor plans of your building. Taking care of properties? Document all the aspects of the buildings so that your staff can go between properties and still know where everything is. Keep records of new installations directly in the map. 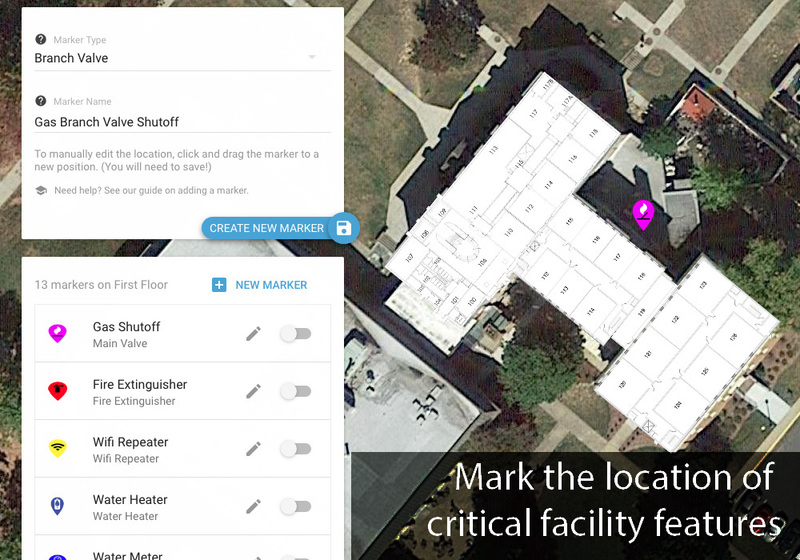 Embed your floor plans and keep track of how everything works. Document your institutional knowledge within MapPlug. 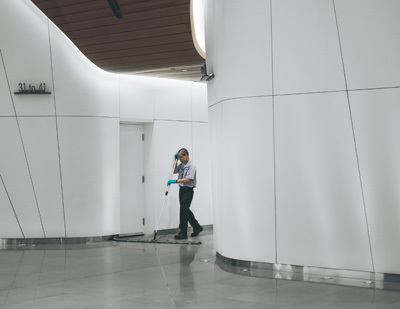 Create step by step guides detailing how to take care of different building tasks and maintenance so that staff turnover or retirements doesn't leave you in the dark. Help any building tenant take care of an emergency situation so that your job is easier. What if you have issues with the gas lines at your school, and the maintenance man isn't there that day? By storing your floor plans and infographics in MapPlug, any staff member or administrator could learn in a moment how to deal with the issues. Keep track of where all your assets are and how to operate them in one central location. Track office furniture and equipment. Maintain an interactive database of your floor plans with infographics and instructions for everything. Selling your building? Document everything for an easy handover to the new owner. 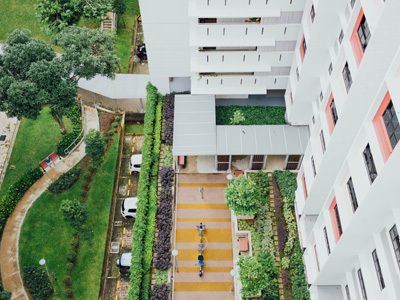 Tenants can help manage day-to-day operations of residential buildings or come out in an emergency to act fast to minimize damage to the building. 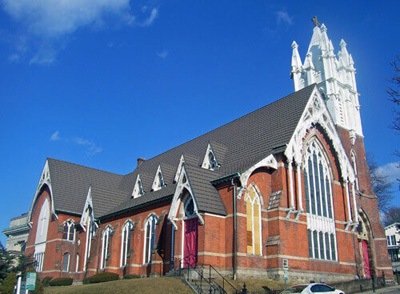 Centralize information on where critical assets and security systems are within your church building, for routine maintenance or in a time of crisis. 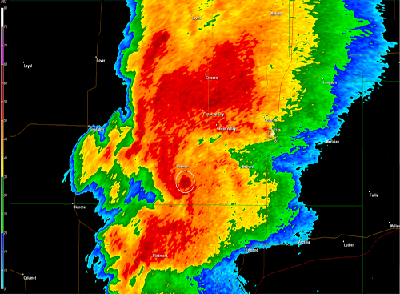 ‍Organize location plans for tornados, hurricanes, earthquakes and other natural disasters. Note the locations of defribrillators and other medical equipment. Assemble instructions of where to go during lockdowns and the steps to take to ensure safety in the case of an attack or an active shooter. © 2019, MapPlug LLC. All Rights Reserved.